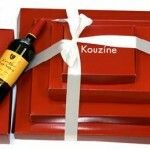 Head on over to Kouzine’s in Miami for their 6 hour Food & Wine Tasting Event, today from noon to 6:00pm. Parking available at 2947 Coral Way – please be cautious as children are crossing! This entry was posted on Friday, March 19th, 2010 at 12:36 pm	and is filed under 365 Things To Do In Miami. You can follow any responses to this entry through the RSS 2.0 feed. Both comments and pings are currently closed.